Do you remember that in 2014 Rhode Islanders approved a vaguely worded $35 million bus hub transit bond? However, at this point, with that much money at stake, I think our state should re-examine the need for the proposed Providence train station area bus hub. A news report indicated no Boston area developers were interested in leveraging the voter-approved bond money for a public-private partnership in the train station area. I suspect state leaders support for the bus hub project was predicated on drawing that investment, and so maybe now they are less interested. Recall the hub was a Chafee administration initiative that Raimondo, RIDOT Director Alviti, RIPTA Board Chair Kezirian, etc. inherited so they may not be all that committed to implement it. Further, now that it has apparently been deemed too expensive to build over the railroad tracks, the alternative of taking some of the State House lawn has engendered opposition from historic interests and maybe the Capital Center Commission too. In addition there are concerns the roads in the area are already often congested and adding many more buses can make it worse. However, downtown interests may still want to eliminate or reduce the buses (and the low income people it transports) in Kennedy Plaza and hope a train station bus hub will be an alternative. They seem to have the ear of the Mayor who never much seemed interested in bus transit. Unions and contractors will also tend to favor spending the money on a new bus hub, for the construction jobs. Though needs of the homeless and downtown business owners are both important, they are secondary to the interests of taxpayers who approved the money for transportation. Bus and rail passengers have nothing to gain from building a new bus hub at the train station. The relatively few transferring to/from trains already have 5 bus lines (50, 55, 56, 57, and R) to connect them to Kennedy Plaza and the bus network, plus a place to wait indoors get information, access to bathrooms, even coffee, at an intermodal facility called the “train station.” We don’t need another building, or to add un-needed buses to the already congested area. At this point, I suggest a temporary halt to planning the bus hub project until the new RIPTA CEO comes aboard (likely later this fall) and can take a fresh look. I say this even though it is a RIDOT rather than RIPTA project, as it is for a new bus facility. Similarly I hope RIPTA will suspend their planning for the $17 million enhanced downtown corridor project, and the multimillion procurement of new fare boxes until their new CEO can evaluate those projects too. With its having lost almost 5 million riders/year in the last few years, RIPTA can’t waste this rare opportunity to access a relatively large amount of money to try to turn this around. 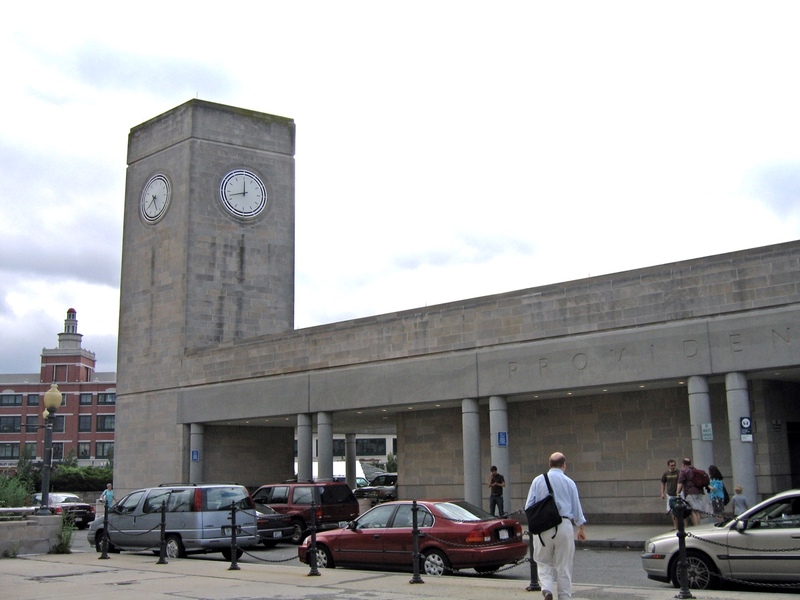 Finally, I do think we can use some of the bond money to improve the rail station hub – with outdoor canopies at the bus stops, real time bus arrival information there (as trains have and KP has for buses) as well as improving bus facilities at other hubs – for example at the airport, Wickford Junction, Woonsocket, and Pawtucket. Barry Schiller is a retired Rhode Island College math professor, is a long-time member of the State Planning Council’s Transportation Advisory Committee. He also was on the RIPTA Board of Directors 1995-1999. By leaving the perpetually empty Superman Building (it never be put to use) the city has in effect decided that downtown is no loner a viable business center. Executives and professionals from Barrington and Eats Greenwich used to like taking the bus rather than drive. Remove the buses and that would change. All the more reason to get out of downtown. There really is no reason for businesses to locate in downtown. Lawyers may stay there because of proximity to the courthouse, but the city has decided that downtown is for residents and tourists,not businesses. Couldn’t agree more…the idea of taking a piece of the State House lawn for a bus barn and a residential tower of undetermined height is absolutely absurd, and shows how little regard our city officials have for both design and history…..
Other cities have dedicated bus platforms at their train stations. Boy I was really hoping that giant open lawn area across from the mall with high value and almost zero use would finally be developed, this is terrible. So all real and noticeable transportation improvements (which are needed) are coming to a halt because some investors are all of a sudden not as interested? The missing link between bus and train is a persistent issue for providence. As is the reality that we are reliant on buses (for better or worse) and need to therefore improve the status and effectiveness of our intermodal options linking buses to other increasingly important modes of transit. The proposal to reduce the statehouse lawn to provide much need housing near the train station (Transit Oriented Development or TOD) is another vital step that will improve ridership and increase service on our commuter rail lines. Having people living near our transit hubs. Makes them more likely to use these services. The old suburban / urban commuter model is an antiquated model. Whether we need to build a building to achieve this is a valid point; however, we are not in California, Australia or Curitiba where open air bus hubs are the norm. We are in New England. If we can use this new hub to make our transit system more useful, improve ridership (get people out of cars) and increase housing near transit it will be a worthwhile investment. To paint it as a storage shed conjures up images of idling buses and fumes and does a disservice to the state’s long range transportation vision and the nature of modern bus services and facilities. So… let’s just disregard that the taxpayers voted FOR an intermodal facility at Providence Station? I disagree. We voted for this facility because it makes sense to co-locate different forms of travel at one location. For convenience, yes, but also to maximize use of all the public space. I find it interesting that no developers were interested in developing over the train tracks at the train station at this time, but I could see that changing in the future. There are probably developers that don’t have interest in a public-private partnership, but would much rather long-term lease the land as Capital Properties currently does in the Capital District. In the future, this land adjacent to the train station will be in such demand for apartments for commuters, there is absolutely no doubt of that, it is just timing and structure. With respect to the State House land that will be allocated towards development, I always assumed that was the sweetener of the deal for developers to buy into a partnership. I have no problem carving out this land since it was never intended to be used the way it is by the architect, and the excess land on the fringes of the State House parcel will ultimately fall prey to the political elite turning them into surface parking lots. Might as well do something worth while on the land, while preserving the State House lawn areas for public space. I disagree that executives use RIPTA, but the bus network was not made for them, so that is a moot point. The reason why so many taxpayers agree that moving the buses to a centralized bus hub is a positive for the city is because it will simplify transportation, and clean up Kennedy Plaza. Anyone who spends time downtown knows that KP is a toilet that you can’t walk end to end without being propositioned for money by at least 3 or 4 people. The trash that piles up outside the 7/11 from single serve drinks, pizza slices, pastries, etc. is just as disgusting as the endless trail of cigarette butts that people loitering (not traveling) toss on the ground without any care at all. A KP with no buses is really something that could finally attract more businesses downtown on their own without tax breaks. Right now, its a negative not a positive. As long as it stays the way it is, downtown will be for residents and tourists, and not working professionals because no company is attracted by the filth of KP. I support Barry’s recommendation to put the Intermodal Transit Center and Downton Transit Corridor on hold. $35 million in transit funding could be put to better use by upgrading regional transit hubs to reduce congestion at Kennedy Plaza, and investing in the same approach to bus stops in KP that has been used in airports and train stations for the last 50-100 years. (If there are never more than five or six buses in KP at any one time, do we really need more than five or six bus stops?) All major investments that have irreversible, long term consequences should be delayed not just until the new RIPTA CEO is on board, but until the State’s recently announced comprehensive transit master plan is completed. What is the point of moving ahead with these projects, and then doing a comprehensive study to determine if they were the right things to do? There is a valid case for better bus service at the train station, but one thing is clear without a comprehensive study: there is no need for a 12-bay bus terminal there! Sadly, the $35 million bond for a new bus hub was almost certainly a political move to appease downtown interests that don’t like the current activity in and use of Kennedy Plaza. That money could still go to great use to improve the bus operations and around the train station. Connect Exchange Street to Gaspee as a transit-only road with dedicated bus lanes extending from the train station to Kennedy Plaza along Exchange. Take a look at the new bus-only transit centers in Norfolk, Indianapolis, and Rochester. Rochester’s is quite nice, is very well integrated into it’s urban surroundings, and it’s even indoors! Goal #1: Create magnet to draw riff raff from KP. Goal #2: Create urban amenity to motivate profitable real estate development. They had to know it was a long shot. Seriously, just extend Exchange St over the tracks to Gaspee Street. Expensive, but the only part of the entire plan that will actually improve transit. Goal 1. I think the “riff raff” in KP largely falls into two categories: people waiting to transfer from one bus to another (or who show up early for a bus because they are unsure when it will leave), and panhandlers largely targeting those people. If you reduce the former by reducing the number of transfers at KP and the wait time to transfer, then you will also reduce the latter because there will be fewer people to prey on. We don’t need a “magnate,” we need a more efficient transit network. Goal 2. Urban open space is a valuable amenity when it is actively used, and a liability when it is not. KP (and Burnside Park: the two should be thought of as a common space with different uses) will only become actively used when there is a more compact RIPTA footprint, and more residential and commercial development within a five-minute walk. This requires developers who are willing to invest both in adjacent areas and in amenities in and around KP/Burnside to animate its use, and municipal leaders who support downtown development. I agree that there is a pressing need for a road over the tracks by the train station, but I would argue for extending Park Row to Gaspee rather than Exchange Street. It would reduce bus traffic for the full length Exchange Street, making it more pedestrian friendly (it’s the only pedestrian link between the two) and more desirable for residential development. The façade facing the open space over the tracks could be the primary pedestrian entrance to the train station/transit center. The opposite façade, facing Park Row, could become the primary egress from cars and cabs; the façade facing the Capitol could be used as expansion space to accommodate more bus and in-state commuter rail travelers; and the façade facing the Avalon Apartments, could accommodate a service corridor for both travelers and people working and living nearby. When you take the escalator from the tracks to the main station today, you face a glass brick wall: how cool would it be if you were greeted instead by a view of a tree-filled plaza and the skyline of downtown Providence? I still don’t understand why buses need to terminate in Kennedy plaza or anywhere in downtown Providence. Can’t transfers and driver changes happen at multiple points throughout the system? Also, The assertion that the bus station must be physically attached to the train station for people to make transfer from bus to train is absurd. All of downtown Providence and much of college hill is within walking distance of Providence station. Do you ride the buses? The buses, with few exceptions, are used by working poor people. They need to transfer to get to and from their low paid work.Multiple transfer points would not work for them. I was a RIPTA rider for 8 years. First of all, there’s no reason all buses have to terminate in Kennedy plaza. Routes like the green line from broad to pawtucket are much better. Secondly, there are several streets like Weybosset within walking distance of Kennedy plaza, that also currently have bus stops. Transfers could happen within downtown, but outside of Kennedy plaza, just as easily with less congestion. Buses terminate at KP because there is this widely-held notion that any trip involving more than one bus transfer is worse than root canal. But three shorter bus rides (with no transfer charges) and a total wait time of 15 minutes at clean, safe transit hubs would be far more desirable than two relatively long rides and a 30-minute wait at KP. The fact is, the farther you are from KP, the worse bus service gets because of the one-hub network. Multiple bus hubs would work much better if there were a fast, frequent connector between them, like the R-Line. If they were well designed, they could generate more TOD, too. I fail to understand the furor over the statehouse lawn. The news about the state house lawn was incredibly misleading in the Providence Journal. It had people believing as if there would be development within feet of the State House. How many people that actually ride the buses want multiple hubs? As a car free person who uses the bus often I am baffled anyone would really want to have to do more transfers rather than less. I’m lucky enough that two of my most used routes have merged (17/33, and 19/34) so I go out of my way to make sure I grab those buses over any others if I can, even if it means a little extra walking. To Arman’s point, I think multiple transfer points make sense. But I understand what the objections are: there are basically too factions of people who want to change Kennedy Plaza. One factions wants KP to have fewer buses running through it so that the system can have better transfers (and that would still mean having some buses run through Kennedy Plaza, and KP remaining a major hub). The other, very vocal faction is the Paolino-led one that thinks KP is full of hoi peloi (several of the commenters also alluded to this). We need to make sure no one is trying to de-bus-ify KP, and instead that changes are being made for the right reasons, with the working people who take buses in mind. Again, thank you thank you thank you thank you I don’t have to deal with the level of incompetence RIDOT throws at us in Pennsylvania. PA is messed up, but at least our transit works. I agree with Arman that multiple transfer points work well in service areas laid out in a grid, like NYC, which has no bus hubs. But RIPTA’s service area isn’t laid out like a grid – its concentrated in 8 separate municipalities that largely straddle the NEC, which is why I think hubs would work better, especially in bad weather, or when buses don’t run that often. The NYC subway system isn’t laid out like a grid either, and for this reason it has multiple hubs, like at Times Square, Herald Square, Union Square, Barclays Center, etc., etc. This can also result in the occasional 2-transfer trip, like traveling from the Upper West Side to the East Village, involving a transfer at Times Square to the Shuttle to GCT. However this works because the Shuttle runs every 2 minutes. The key to a multi-hub network is fast, frequent connections between them.